The Breakers Palm Beach is an idyllic setting for girlfriends to celebrate the bonds of friendship. 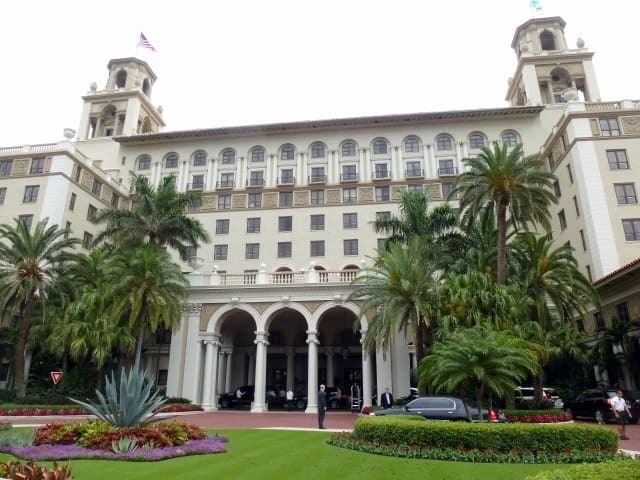 When your taxi arrives at the porte-cochere at The Breakers Palm Beach, you know you have arrived. The exterior structure with soaring towers and gracious arches was built to impress more than a century ago—and still does. after Italian Renaissance-style villas from the 1400s. Once you set foot inside, any misplaced fears you may harbor about classic hotels being stodgy or musty will quickly dissipate. The opulent interior has been as lovingly maintained as the sprawling green lawns outside. An oddity in this world of cookie-cutter, luxury hotels chains, The Breakers remains privately owned by the third generation of the same family. Rather than keeping things the same, they have retained the hotel’s sense of history and character while continually improving and updating the property to accommodate changing trends and tastes—-to the tune of some $20 million each year. Spread over 140 sprawling acres with unparalleled access to the Atlantic Ocean, The Breakers Palm Beach is truly an idyllic setting for women who want get together—-assured that they’ll feel totally relaxed and pampered. Here are five reasons that make this property a unique destination to celebrate the bonds of friendship among sisters and girlfriends, or between mothers and daughters. The Breakers’ private beach on the Atlantic Ocean stretches more than a half-mile. For women who don’t like the feel of sand between their toes, the Beach Club offers five swimming pools, a variety of water sports, and a good likelihood of sunny weather and ocean breezes, with average temperatures ranging between 75-85 degrees Fahrenheit throughout the year. What girlfriend doesn’t enjoy feeling spoiled rotten? Rent one of the 25 beach bungalows (available for daytime use only) so your group can sunbathe on a private patio while being served by a dedicated butler. If you tire of the sun, the equally inviting interior of the bungalow includes a furnished lounge area with a bathroom, shower (some of them outdoors), and other amenities such as a stocked refrigerator, flat-panel TV, and Wi-Fi. The 540 guestrooms offer a wide variety of choices in terms of size, location and rates. Depending on the number of persons in your group and how you want to split up, you can choose Deluxe rooms (limited to two persons), larger Premium rooms, or opt to stay in one of the resort’s 68 magnificent suites, all with ocean, golf course or garden views. After a five-year, $80 million dollar room facelift competed in 2011, the rooms are tastefully furnished with elegant furniture and beautiful bedding and drapery fabrics in pastel hues that complement the seaside resort’s location. The exclusive Flagler Club on the top sixth and seventh floors of the resort offers a boutique “hotel within a hotel” experience. Available throughout the day, the changing Lounge menu offers continental breakfast, afternoon tea service, before-dinner hors-d’oeuvres, and decadent desserts and beverages. Trained concierges not only respond to but anticipate your needs. With a choice of nine restaurants (in addition to 24-hour room service) and five bars, you and your friends will never get bored, whether you opt for light meals or elegant dinners—-or choose to eat off the property in nearby restaurants. On the grounds of the resort, you can dine indoors or alfresco, and choose from contemporary American, steakhouse, seafood, Italian, and Asian-fusion fare. A favorite with girlfriends, both guests and locals, HMF is a sophisticated but lively venue on the main floor at which you can dine, drink, people-watch, and be watched. With the ceilings and chandeliers newly restored to their original splendor, the room (which has been three years in the making) is decorated with custom mahogany furniture bathed in shades of plums and greens. A throwback to the cocktail culture of the 40s and 50s, the attentive wait staff is attired in little black dresses with ponytails. The eclectic plates, from sushi to salumi, are meant for sharing and the Italian silver forks are long enough to help you easily reach over to your friend’s dish. You can order a Margherita pizza baked in a wood-oven, garganelli in cream sauce topped with chunks of succulent lobster and breadcrumbs, or scores of other equally tempting plates. The drinks are as inventive as the food and range from vintage to contemporary: The Redhead is a mix of vodka, blood orange liqueur, and cranberry juice topped with lime foam. The Chanel #6 is a mix of vodka, Chambord and pineapple juice. When girlfriends meet, they don’t always want to do the same things; they often opt for some time together and some time apart. The Breakers offers something for everyone: two 18-hole championship golf courses, ten tennis courts, yoga instruction, two fully-equipped fitness centers, a jogging trail, bicycle rentals, and scuba diving lessons. The 20,000 square-foot spa with 17 treatment rooms has indoor and outdoor space—-and offers an extensive menu of treatments including Guerlain facials. In case you forget your toothpaste or need to pick up a last-minute thank you gift for someone who picked up the slack at home while you are gone, there are ten on-site boutiques. Palm Beach is a terrific location, no matter what a girlfriend’s interests. The Breakers is located within walking distance of the legendary Worth Avenue with its designer shops and local boutiques interspersed between tropical courtyards and gardens designed by Addison Mizner. Also nearby in West Palm Beach is the Italian- inspired CityPlace, with restaurants, shops and live music and entertainment. The destination offers an exhaustive list of things to do, from sports to eco-adventures to performing arts and more. The resort is only seven miles from Palm Beach International Airport and is also accessible from airports in Fort Lauderdale and Miami. Yes, girlfriends can find far less pricey places to renew the bonds of friendship, but a stay at The Breakers is likely to create unforgettable memories and forge new traditions. This post is part of a Blog Carnival sponsored by my fellow travel writer Monika Fuchs at Reiseblogger Fotoessays. Her travel site is in German but you can use Google translate to read the text. The pictures don’t need translation! Thanks Irene. Will put The Breakers at the top of my destination list. I remember having lunch in that dining room, what a lunch. THen walking afterwards around this place was such a treat! Thanks for linking up today. I am ready to go and enjoy this wonderful old place. Elegant and impressive. Even the name – The Breakers – suggests pedigree. Like you better know which fork to use with your fish. Yes an elegant property but the ambiance is relaxed and casual—not intimidating at all.